An important part of your home preparedness plan is gathering basic canning equipment essentials. You can use your canning equipment year after year. If you don't know how to use the equipment, we'll teach you. Learn to be self-reliant and preserve your own food. As you go through this page, click on the blue links to learn how to use the equipment. Have Fun!!! Support Provident Living Today by Shopping Here. You'll use these basic canning tools in almost every canning project. Canning Funnel fits both regular and wide mouth jars and helps you fill your jars without making a mess. Canning Tongs are used to lift hot food like corn on the cob out of boiling water. Lid Lifter has a magnetic tip on the end of it. This tool helps you remove hot canning lids from boiling water. Jar Lifter is used to lift your hot jars out of the canner. Jar Opener is used when you go to open a canning jar that is tight and sticky. Just a note on sticky canning rings. If you'll turn your jar up-side-down and run hot water over it, it's much easier to open. Some people are afraid of pressure cookers, but you don't need to be. 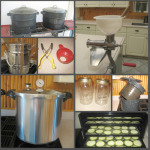 We teach you how to use your pressure cooker and the rest of your home canning equipment. Has a safety Pressure Regulator. This regulator rocks and lets off steam before the pressure gets dangerously high. I have two of these - Comes in handy when processing a lot food. NOTE: Do Not pressure cook on a camp stove. The heat is too high and will ruin your cooker. I keep an old kitchen stove on the patio for pressure cooking in the summer - works great if you want to keep the heat and mess outside. A boiling water canner or hot water bath is the canning equipment you'll use for processing high-acid foods. This would include all of your fruits, jams, juices, and pickled food. I have two of these boiling water canners. You can process twice as much food at the same time when you have two canners going. You can put a boiling water canner on a camp stove and keep a lot of the heat and mess outside on the patio. Learn how to use a Boiling Water Canner. The skins slide right off after they've been blanched. Using a steamer juicer is my favorite way to soften apples when making applesauce. No burning, no stirring, very efficient. I love the Norpro model. It has a glass top and I can see into it without removing the lid. High quality. A Victorian Strainer is used when making applesauce, tomato sauce, and tomato juice. The sauce is easily separated from the skins and seeds. It makes beautiful sauce and is so easy to use. A Food Dehydrator is used to dry all kinds of food. Dried apples are my family's favorite. Here's the canning equipment you'll need for dehydrating food. 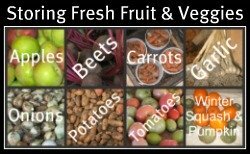 You can use an electric dehydrator or a non-electric food dehydrator. A V-Slicer is a very handy tool when Dehydrating food. It makes those thin even slices. The Swissmar Borner V-Slicer Prep is one of my favorite kitchen tools. I use it a lot. My slicer is 15 years old and the blade still works great. This is the only kitchen tool I have to make slices thin enough for dehydrating apple or zucchini chips. I love it because you can quickly slice, dice, and chop your food. Another plus is that it cleans up fast and easy. Click on V-Slicer Pro Mandoline to see a video demonstration. Note: The V-Slicer Prep is about $10 cheaper than the V-Slicer Pro. The Prep doesn't have the dicing capability of the Pro.